Includes Lessons 1-8 from the Level 1 program on 4 CDs and as MP3, 3 hours of reading lessons as MP3, and a companion Reading Booklet. For almost 50 years, in over 50 languages, the Pimsleur® Method has been recognized by experts worldwide as one of the fastest and most effective ways to learn to speak another language. 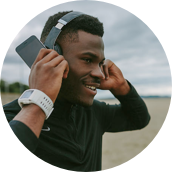 With Pimsleur you will learn Spanish in the same way you learned your first language as a child, acquiring the vocabulary of the new language, along with the melody, rhythm, and intonation of Spanish as used in everyday conversation. Dr. Paul Pimsleur's research on memory was one of his most significant achievements: he discovered that if reminded of new words and information at gradually increasing intervals of time, the learners would remember the words or information for increasingly longer periods. Dr. Pimsleur documented that the acquisitions would actually move from short-term into long-term, or permanent, memory. Pimsleur Language Programs use the same revolutionary learning Method to teach you to read, as well as to speak. You will start by sounding out Spanish, learning to associate the new sound system to the English alphabet you know. Gradually you will learn to look at the words and see them with "Spanish eyes." And you will learn to read Spanish without an English accent. 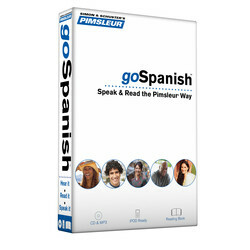 goSpanish makes it easier than ever to use the Pimsleur programs by including the spoken lessons in two audio formats. Now you can listen anytime, anywhere: in your car or at home and on your MP3 player. Bonus: a digital Ultralingua Spanish-English dictionary with 200,000 items, including colloquial terms and common expressions. An Instant Credit of $100 towards the purchase of the Pimsleur Comprehensive Level 1 program directly from Simon & Schuster, with 30 lessons on 16 Audio CDs. Please see www.pimsleur.com/goSpanish for details. Note: The purchase of this product alone does not qualify for an Instant Credit, or for the Proficiency Guarantee. Pimsleur’s Proficiency Guarantee. We believe so strongly in the effectiveness of the Pimsleur Method that we will guarantee your spoken proficiency if you continue and complete the Level 1 Pimsleur program. For more details visit www.pimsleur.com/Proficiency-Guarantee.